McDonald's is starting to look like the restaurant world's comeback kid. Just six months ago, McDonald's (MCD) looked like it was in free fall, with sales and traffic declining around the globe. 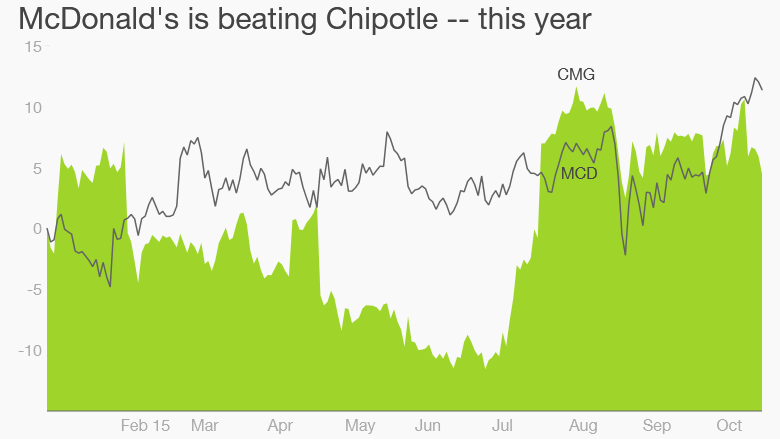 America had already traded up to Chipotle (CMG) and Shake Shack (SHAK). But now there are signs that a slew of changes made by McDonald's CEO Steve Easterbrook may have stopped the bleeding. The boldest move was the recent launch of all-day breakfast, a dramatic shift aimed at juicing sales by luring in customers who love Egg McMuffins no matter the time of day. McDonald's has also tried to counter Chipotle by improving food quality. It plans to cut back on chicken raised on antibiotics and has promised cage-free birds within 10 years. Wall Street is betting that these are winning moves at McDonald's. McDonald's shares have jumped 11% this year. Just last week the stock hit its first new record high in two-and-a-half years. Not only are McDonald's shares beating the stock market, they're besting rivals Wendy's (WEN), Chipotle and Burger King owner Restaurant Brands International (QSR), at least this year. "It's quickly becoming a turnaround story," said Howard Penney, a restaurant analyst at Hedgeye. The bet is that McDonald's has finally reached an inflection point -- and we will learn more when the company posts results on Thursday. Penney was bearish on McDonald's for three years until this summer when he flipped to the bull camp based on encouraging comments from Easterbrook, who became CEO in March. In his first 100 days Easterbrook set a positive tone, saying things like "everything is in play," "we will try new things" and that he'd be an "internal activist"
"They had to get rid of the CEO who wouldn't admit there are problems to get the CEO who will fix the problems," said Penney. Credit Suisse just added McDonald's to its U.S. Focus List as "one of its top investment ideas." "Sales are turning," Credit Suisse analyst Jason West wrote in a recent research report. He expects global same-store sales to turn positive in the third quarter, thanks to better international results. Credit Suisse said its checks indicate domestic sales are "starting to recover" and all-day breakfast is "off to a good start." All-day breakfast launched on October 6, generating lots of positive buzz for the brand. 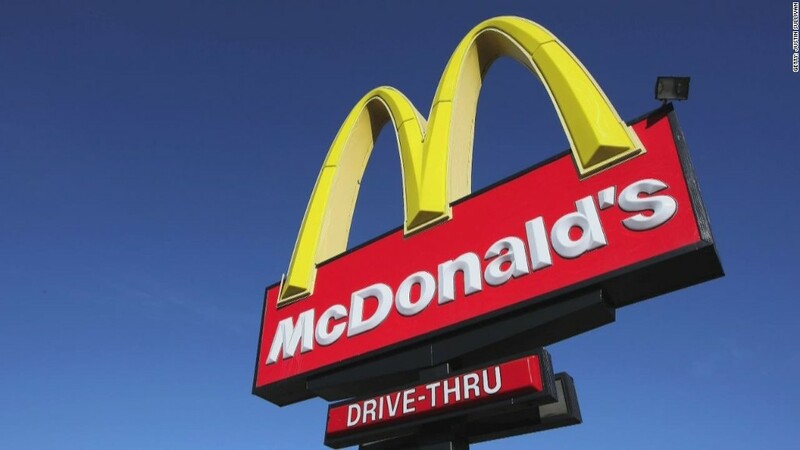 McDonald's franchises surveyed by Nomura estimate all-day breakfast will boost fourth-quarter sales by 1.5 percentage points. "I believe that my stores have reached the bottom of the $1 McDouble slide. (Sales) seem to have been leveling out and starting to climb," one McDonald's franchisee responded in the survey. Can McDonald's cut its tax bill? 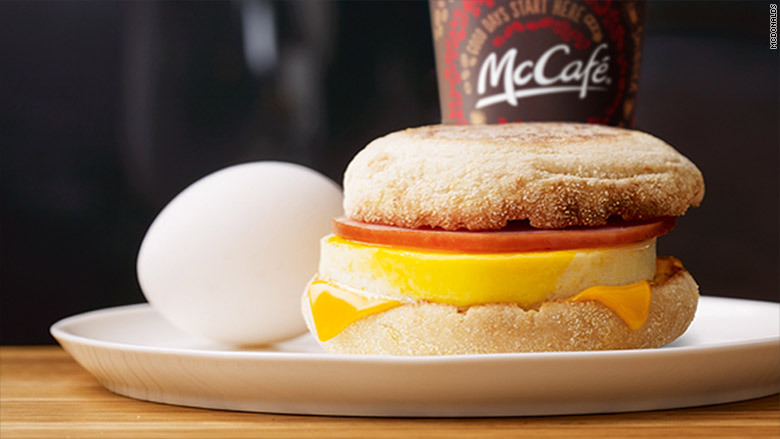 While customers may love Egg McMuffins in the afternoon, investors are craving a stroke of financial genius to lower the company's tax bill. After years of resistance, McDonald's now may be listening to shareholders who want the company to spin off its vast U.S. real-estate assets into one tax-efficient real estate investment trust, or REIT. Penney estimates that if McDonald's can slash its tax bill by a "very doable" $1 billion, it could boost its stock price by $20. But it's not that easy -- a REIT spinoff could be messy and further inflame relations with franchisees. Credit Suisse said other options include selectively selling properties or ramping up on share buybacks and dividends by leveraging properties. Don't expect a solution to this complex problem this Thursday. That could come on November 10, when McDonald's lays out a bigger-picture strategy at its analyst meeting.